CHARLOTTESVILLE, Va. — U.S. officials have opened a civil rights investigation into the circumstances of the deadly car attack that took place amid clashes of white nationalists and counter-demonstrators in Charlottesville, Virginia. 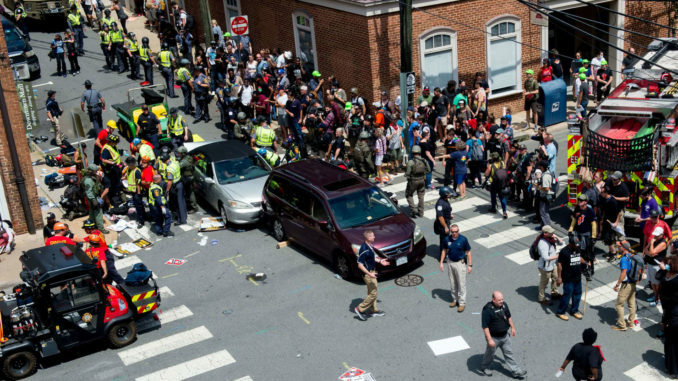 One person was killed and 19 were hurt when a speeding car slammed into a throng of counterprotesters in Charlottesville, where a “Unite the Right” rally comprised of right-wing groups had been scheduled to take place, the city tweeted on its verified account. A 32-year-old woman was killed while walking across the street, Charlottesville Police Chief Al Thomas said…Two Virginia State Patrol troopers were killed in a helicopter crash while “assisting public safety resources with the ongoing situation in Charlottesville,” the agency said in a news release. The violence prompted the governor to declare a state of emergency and law enforcement officers to clear the area. The demonstration, which both organizers and critics had said was the largest gathering of white nationalists in recent years, began with a march Friday night. Loud chanting of “blood and soil,” “white lives matter” and “you will not replace us,” resonated from scores of white nationalists holding torches who marched across the University of Virginia campus in Charlottesville on Friday night. The event escalated Saturday morning as hundreds more gathered…Hundreds of counter protesters quickly surrounded the crowd, chanting and carrying their own signs. By 11 a.m., the scene had exploded into taunting, shoving and outright brawling.